One of the most sought after properties. Elegant gorgeous views overlooking Telluride. A fire table completes this one of a kind property. Spectacular and stunning views from your rooftop penthouse. Dining area with French doors opening to the rooftop deck. Exceptional rooftop views to the east and north. Large, spacious master bedroom with private deck access and red rock views to the north. French doors leading from the master bedroom to the rooftop deck. 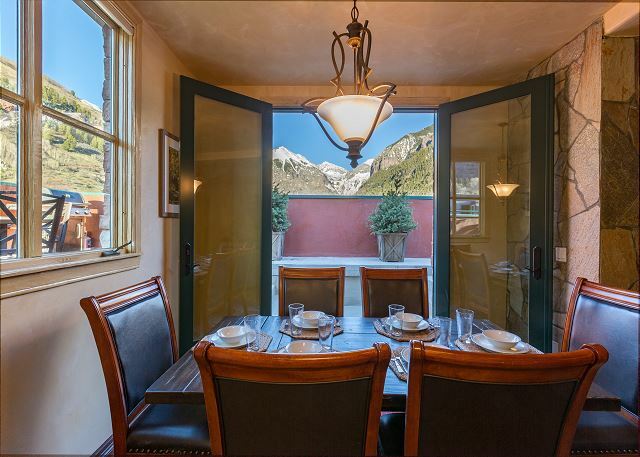 Kitchen and dining area with stunning views of Telluride's box canyon. 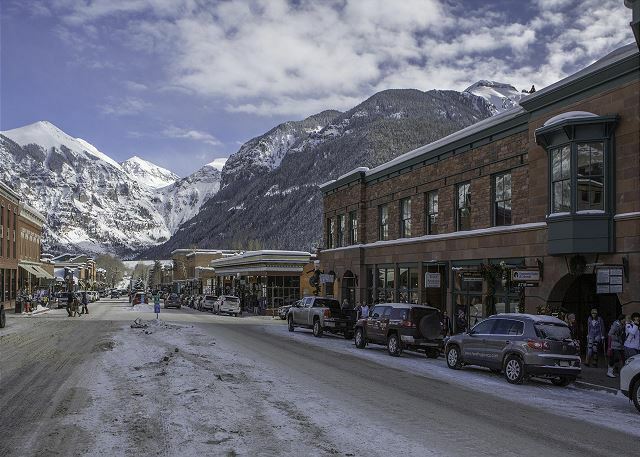 Colorado Avenue - Telluride's main street. View from The Rooftop deck. The most perfect Telluride location. Spectacular view of Ajax Peak and Ingram Falls over Telluride. Fire table, BBQ gas grill and comfortable outdoor seating. This is where you want to be! A rooftop penthouse in the middle of Telluride's Main Street. The Rooftop is perfectly perched on the top of the Wintercrown building. This is the building to the right with the green trim. Guest room #2 with Queen bed and ensuite bathroom. Comfortable outdoor furniture on your rooftop deck. Foyer and hallway. Numerous skylights bathe this rooftop penthouse with natural light. Guest room #3 made up as a King Bed with ensuite bathroom. Back deck view looking southwest toward the ski mountain. Enjoy outdoor living at its finest. Large master bath with steam shower, large jetted tub and double vanities. Master bathroom's over sized jetted Jacuzzi tub. View from The RoofTop looking Southwest. The free gondola runs daily 7am to midnight. Welcome To Telluride shower amenities are in every bathroom. The RoofTop is located on the top of the Wintercrown Building in the center of the Main Street in Telluride. Experience The RoofTop Penthouse, a penthouse vacation rental, located on Colorado Ave in the center of downtown Telluride with shopping, restaurants, and activities right outside your door. 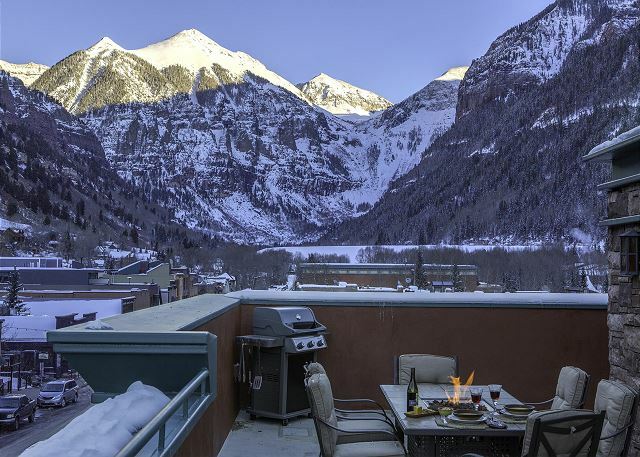 Telluride's natural beauty can be seen from the spacious rooftop deck and also from inside this vacation rental - a rare and remarkable view not had by many properties in Telluride. The outdoor deck adds both winter and summer appeal with patio furniture, table and chairs, and BBQ grill. This vacation rental features 3 bedrooms, 3.5 baths, and is perfectly configured for couples or a family, with bedrooms nicely spaced for privacy. No car is necessary at this vacation rental because it is in the center of town and everything is within walking distance. If you are a skier, you are less than 3 blocks walking distance to the gondola! 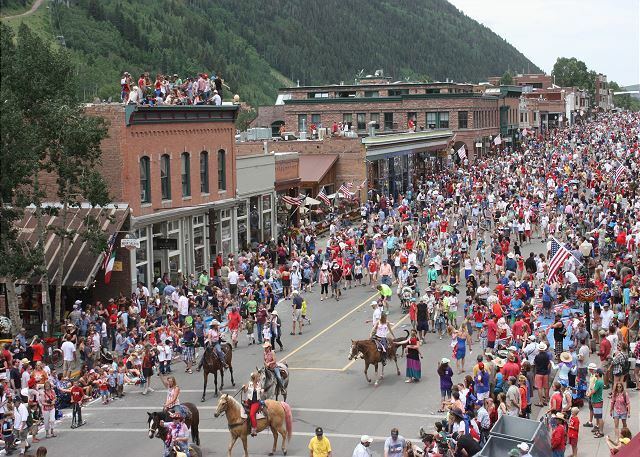 If you are attending one of Telluride's many summer festivals, you are a short 3 blocks walk away from the festival grounds. 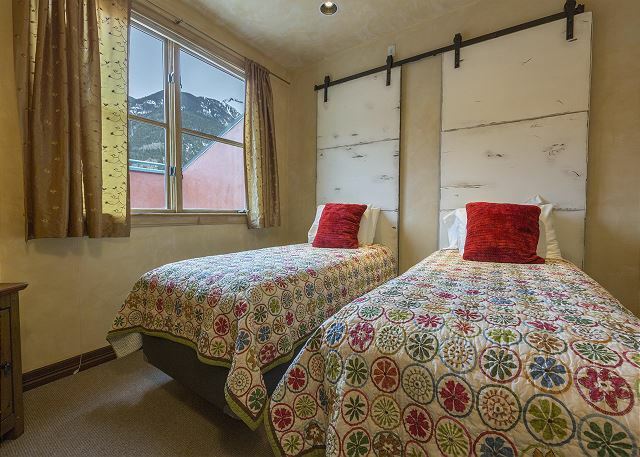 This affordable Penthouse is the perfect location for summer or winter in Telluride. It is Telluride at its best! Your vacation will be made as convenient as possible with a complimentary Full-time Host and Concierge. What better way to arrive in Telluride, especially if it is your first visit. We look forward to Welcoming You to Telluride! It was great! Great location and great accommodations! I have been coming to Telluride for twenty years and this was my 3rd year renting The Rooftop. Pam handled the reservation/paperwork and answered all questions while offering recommendations. Peter met us upon arrival and after bringing up our luggage he then showed us how to operate everything. 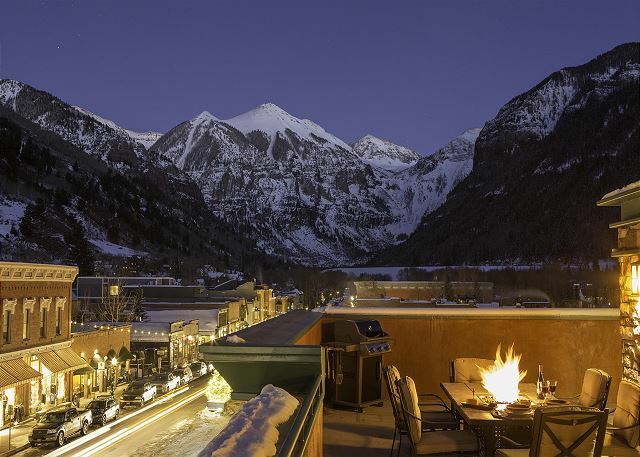 The Rooftop's location is right in the middle of downtown Telluride. It has underground parking and an elevator. All rooms are on one floor ski being seniors we appreciated no stairs. Views amazing, condo well equipped. During one stay we encountered a small problem and Peter resolved it quickly. Peter also "checked on us" a couple of times during our week, a nice personal touch.Over the years I have rented many homes and condos and Pam and Peter provided me my best rental service and experience. This is a great condo in the middle of town. Any small issues that we encountered were quickly addressed by the property manager. This place was great for our family of 6 - one of our best summers in Telluride! We have rented through Welcome to Telluride and vacationed in Telluride many times in the past, and Pam and Peter both take the extra steps to make the vacation experience awesome. We particularly loved, the rooftop table with fire pit and grill and spacious outdoor seating, great views throughout the place, and the elevator entry into the living area. Looking forward to coming back again! We had a fabulous time in Telluride and would definitely recommend this place as a great place to stay! We would stay here again! This rental property is exactly that...SPECTACULAR! It has an incredible amount of space, gorgeous views, convenient to all of Telluride, and the best property management service. The rooftop exceeded expectations. Not only was the condo even more impressive than the pictures, but Peter and Pam were awesome throughout. Even provided local recommendations that were all incredible and perfect for our group. The kitchen and pantry were more than stocked so make sure you check it out before you hit the store. This place is checked-out, and we can't wait to go there again!! This is a beautifully furnished rooftop condo on Main St. there are big windows facing north and east and a huge outdoor rooftop. A grocery store is a block away, a pub downstairs, the gondola about 3 blocks away. Everything worked perfectly, and our group of six had a wonderful time. Great place, we will book it again! We sat outside and stared at the beautiful mountains every day! We found this property perfect for our family of five . The unit is comfortable with lots of natural light .The rooftop is even more impressive than the pictures . We visited in early June and there was much to do in the area . 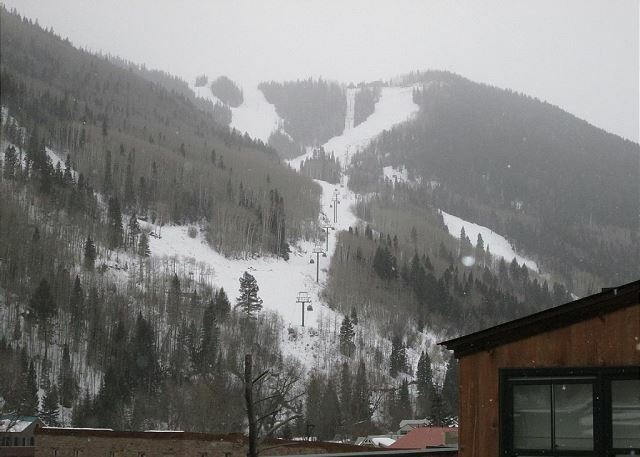 This condo is very close to everything you need to enjoy Telluride . Shopping ; dining , rental companies and tour operators . Peter and Pam do a fantastic job managing the property . They will offer advice and every assistance you need to make the most of your vacation . Great Location, Amazing Views -- Don't Miss The Rooftop! I'm giving this place five stars because it was perfect for my family. It was roomy enough for my husband and me plus four college kids, and the kitchen was fully stocked which I appreciated very much. The views from the deck were wonderful (downtown and Ajax in the box canyon). The beds were very comfortable. The property managers, Pam and Peter, couldn't have been more responsive and checked on us several times during our stay which is so nice. You'll never feel stranded with these two on call -- they were truly warm and helpful without being intrusive in the least. We'll rent this place again because the location was wonderful -- very near the gondola and also close to Town Park. Thanks for all the assistance, Pam and Peter. We'll be back. This is a great property. It is the BEST location you will find in Telluride. It's also very nice and fit 6 people comfortably. Pam was easy to deal with and was super helpful in giving recommendations for restaurants and things to do. I would definitely rent this property again. Thanks to the staff of Welcome to Telluride, Pam and Peter! We had a terrific stay at the RoofTop condo. I really appreciated all the wonderful kitchen appointments, new appliances, new cookware, new bake ware and high end small electricals. I think we used them all! Everything was lovely. Only ask would be to have TV's in the bedrooms too. The ultra high def TV in the living area was amazing too! Terrific picture! Internet was great too and that is not always the case in T-ride. Can't wait to stay at RoofTop again! We loved this place! Had a ski vacation with our two teenage boys and they loved the location being right in town. It was bigger than we expected with high ceilings and natural light from the many sky lights. Beds were comfortable, nice kitchen with everything we needed and we enjoyed the gas fireplace every day. It was cold when we were there so we didn't use the rooftop but it looks great. This place could be loud during high season or festivals as it's on main street and we heard some late night post bar action a few times but we turned on the humidifiers and it did a good job of drowning out the sound. Great location to the lifts...we would rent here again! We loved staying at The Rooftop in Telluride during the Bluegrass festival. It would be the perfect place to stay anytime of year with spectacular views, convenient downtown location and very nice accommodations with your own elevator! The basement parking spot was helpful too. We had a great time at The RoofTop. It was conveniently located, just a couple blocks from the ski lift & gondola. The underground parking was great to have as well, as parking around town is tough. Close to restaurants & bars. Nice place, every bedroom has a bath/shower and great patio and view! Pam (who handles reservations) and Peter (on-site concierge) could not have been better. Both are highly professional and kind. The property has recently had many improvements, and the location cannot be beat. We literal walked across the street or a block away to do everything. And the views are postcard worthy. You cannot go wrong at The RoofTop! We would definitively stay there again. Loved the Location....and faboulous view!